Don''t like wearing a collar in the house but still want tags on just in case? Our tag necklaces are an attractive way to wear tags without a heavy collar. They range in size from about 16-19 inches long and are made from bolo braided genuine leather. These necklaces are designed to slip over the head. They are designed to be break-away. If it gets jerked, either the split rings at the ends will be bent open so that it will "break" there, or, the ends will come unglued. Either way the necklace can be put back together with new split rings or super glue. To ensure the proper fit for your tag necklace, please measure your dog at the base of the neck with a finger under the tape measure to add a touch of slack. Tag necklaces are not designed for restraining your dog and can be ruined if chewed on. 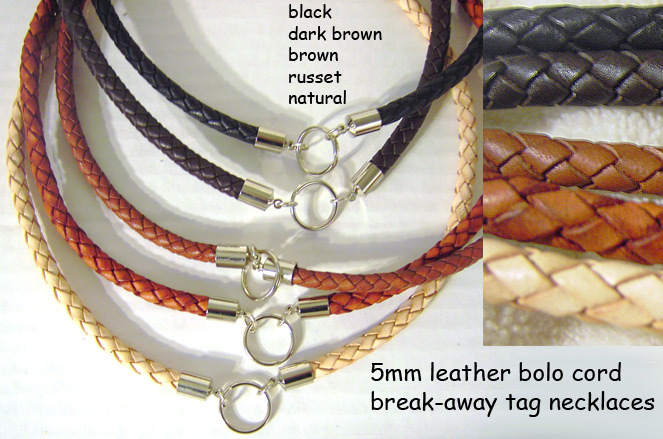 >Leather bolo necklaces - $10. These are break-away by means of small split rings that will bend open if the necklace gets jerked hard. The necklace will then drop off without damage and they can be reattached by replacing the split rings. Alternatively, the ends may become unglued. Super glue will work to rejoin it if this is the case.